inventor of the Montgolfière-style hot air balloon, globe aérostatique (1745-1799). A.L.S. „Montgolfier“. Annonay. 4o. 1 page. A few small spots. To an unnamed recipient, confirming the order of oars in a certain shape: “Monsieur, je suis chargé par M. Leclerc chevalier de lordre du Roy de vous expedier quelques Rames de grand aigle. Vous avés cy joint un ordre pour en retirer d’orleans un ballot pour lequel vous voudrés bien acquitter la voiture et les droits dont M. Leclerc vous tiendra compte en le portant en déduction sur le prix. La suitte de la commission qu’il m’a donné suivra incessament. […] Je saisis avec empressement Monsieur cette occasion de vous faire offre de mes services. J’ay l’honneur d’être bien parfaitement Monsieur Votre très humble et obéissant serviteur”. - Reverse of second integral page bears a partial address panel in another hand. In very good to fine condition, with intersecting folds, a couple passing through portions of signature, a few small spots, and a thin strip of moderate toning along right edge, not affecting the legibility. - Born into a reputable family of paper manufacturers in Annonay, in Ardèche, France, brothers Jacques-Etienne and Joseph-Michel Montgolfier put their small town on the map in June of 1783 when they successfully carried out the first public unmanned hot air balloon flight there; five months later, before a distinguished crowd including King Louis XVI, Marie Antoinette, and Ben Franklin, they would demonstrate the first free flight by humans in their balloon. 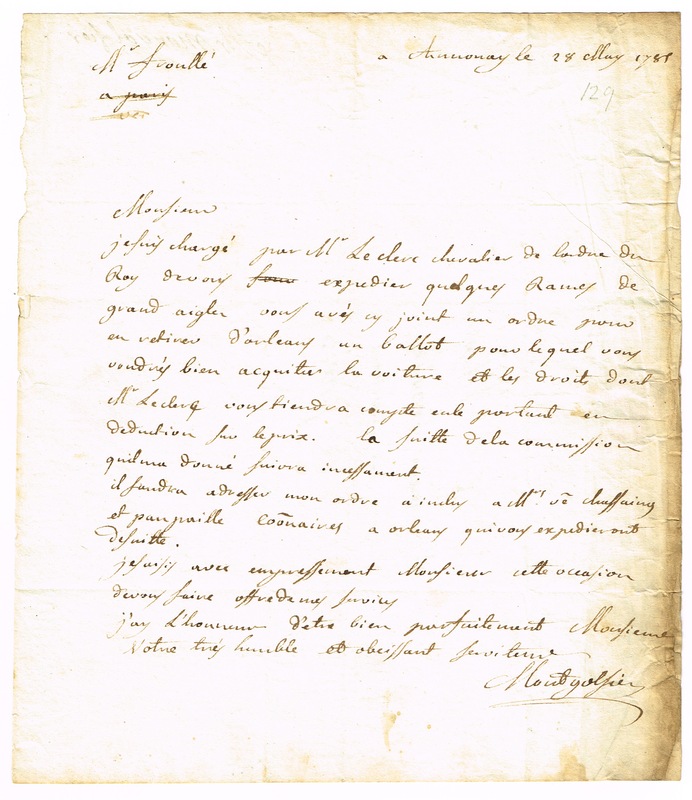 With their family elevated to the nobility, Etienne continued his work with the paper mill, whose business is displayed in this letter, as he sends “a few reams of large eagle” (a paper format) to printer and bookseller Jean-Jacques Froulle. A decade later during the French Revolution, Froulle would find himself on the chopping block—literally—after writing and printing an account of the death of Louis XVI. 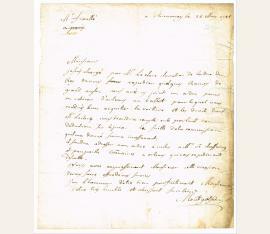 An incredibly rare letter regarding the early aviator’s family business..